Digital Signage is a centralized network of digital displays for your brand allowing you to create visually appealing and targeted messages for reaching and engaging your audience. In other words, digital signages are dynamic displays of information. If you want to promote your brands or products, then digital signage could be the way to do so. You can play ads, informational messages, promotional content, etc. 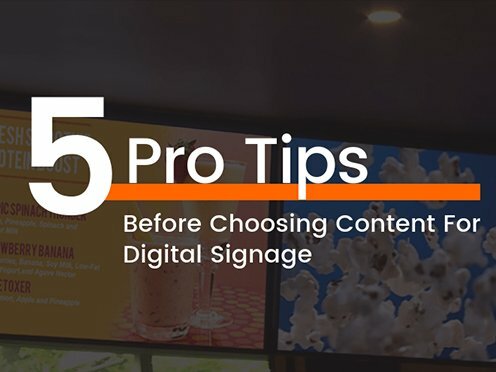 Here are five tips to make sure your digital signage is working for you, every time. Brands are usually under the impression that the more content you create, the more visibility you’ll achieve. However, this is not true. Human eye cannot grasp and remember everything they see. Hence, the content that you run on the display should look clutter free. Many a times the text is a miss when a person looks at the screen. It can be because the text is not highlighted, font is too small, or the font style is too complicated to read. The text is also dependent on the viewing distance and the size of the display. Bigger the size of the display, bigger the font or farther the display bigger the font. If you are going to add typography to your content, keep the typography simple and large enough to read from a distance too. Don’t forget to test it before you go on-air! Nobody likes a dull or boring display. They will usually skip seeing it if the content is not appealing to their eyes. Create a content which is not only colourful but vibrant at the same time. Digital signage allows you to constantly add & change the content if it is getting too boring. It also allows you to play different formats of content at the same time e.g. videos, images, text, etc. Last but not the least, if the information which you want to convey to your audience is a miss, then there is no point of installing the digital signage. Keep the most important information on loop, play it after every 5 slides so that it is not a miss by your audience. An engaging and interactive content is what will drive the attention of the audience. Making sure that the audience can relate to content is a faster way to attract them.